The first film to terrify me was "It! The Terror From Beyond Space." I saw it when I was a preschooler. Simple plot. Take a crew of astronauts and stick them on a space ship with an alien creature that wants to kill them. Great premise. Cut to 1979. I saw "Alien" in Phoenix after a day of floating down the Salt River Project. Too much sun resulted in sever burns on my legs. I had a fever and was shivering. At least I thing the shivers came from the sunburn. "Alien" took the premise of "It! The Terror From Beyond Space" and added great special effects, a smart script, wonderful cast and outstanding direction by Ridley Scott. It was love at first sight. In "Alien" the crew of the space tanker Nostromo is given orders to set down on a space rock to investigate a possible alien life form. The crew meets the alien and a franchise is born. Sigorney Weaver garners an Oscar nomination for her star-making turn as Ripley, the badest space babe to ever grace the screen. Cut to 1986. This time I'm in my 1979 Camaro Z-28. My oldest daughter is two weeks old. She sits in the back seat as my first wife and I watch "Aliens" at a drive-in theater in Las Vegas. James Cameron did the impossible. He took my favorite sci-fi film and one-upped it! "This Time It's War" the ads proclaimed. "Aliens" became an instant classic. The perfect synthesis of the sci-fi/horror and war genres. 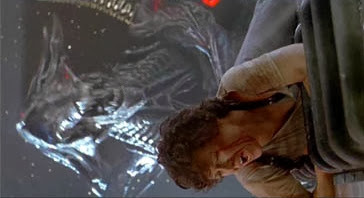 Set 57 years after the original film, "Aliens" returns Ripley to the source of her greatest fear. The planet she landed on in the first film has been colonized. All communication with the colony has been cut off. Ripley is sent in with some very badass colonial marines. Let the games begin. Time moves on. Cut to 1992. Once again I'm in Las Vegas. This time it is a vacation with the person I thought would become my second wife. Time out from the gambling tables to check out "Alien3." David Fincher's film is flawed, bleak and depressing. A major let down after "Aliens." I am angry that those who survived the second film are killed in the opening moments of the third. All save Ripley. Set on an outer space prison planet, "Alien3" was worth seeing more than once only for Charles Dutton's performance. While in college, I waited on Mr. Dutton at "Cafe Max" in Memphis. I told him that I had seen the movie three times. The second two viewings were to study his great performance. Time passages. It is 1997. I'm with my the person who did become my second wife. The previews for "Alien Resurrection" looked cool. 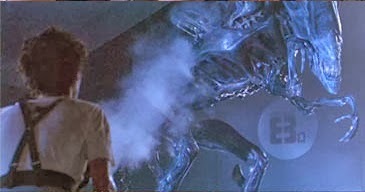 The fourth film revives the long dead Ripley. She is cloned as her body contains the beast from the 3rd film. While "Resurrection" isn't a great film, it is an improvement over the third. Except for the ending. A very bizarre ending indeed. The film does include a couple of classic sequences though. The underwater scene is one of the best in the entire series. Thursday, December 4 of this year. I get home from day four of my murder trial (I'm the lawyer, not the defendant). I find the Alien Quadrilogy sitting on the kitchen table. Excited as I am, I don't even open it. Must finish the trial. Saturday morning the jury returns the verdict. (I win.) 14 hours of sleep later, I tear into the long-awaited DVD. I have seen the director's cuts of the first two films. I want to see David Fincher's work print of "Alien3." I am amazed to discover a vastly superior film to the one released in theaters. Fincher's work print contains entire sub-plots and sequences removed from the theatrical print. I can't imagine why FOX took the film away from him and released the mess they did. To my regret, the DVD doesn't shed any light on the matter. There is no commentary track by Fincher. I then turn to "Resurrection." Director Jeunet was happy with his print. He reluctantly agreed to have an alternate ending and beginning and a couple of other deleted scenes put in for the DVD set. The alternate ending is nice if only because if pictures Paris in a state of utter destruction. The alternate beginning belongs in "Space Balls" rather than in this series. I see why the director was happy with his print. An amazing DVD set. Excellent picture, sound and extras. The movies vary in quality. The first two are classics, while the 3rd and 4th are flawed. However, the work print version of the third film is a real treasure. The only thing missing from this collection is a commentary track by David Fincher. FOX did an excellent job of restoring all four movies. The same goes for the special editions. The deleted footage was restored and color matched with the theatrical footage. The new scenes are seemlessly intercut with the previously released footage. For the work print of "Alien3," FOX used CGI technology to create the alien effects that were not done originally. Some of the CGI effects are not as good as it would have been had the effects been done originally, but I'm happy for the technology. This allows us to see what might have been had Mr. Fincher not had the movie taken away from him. Like I said before and will say again: Fincher's work print is the real treasure of this collection. Excellent, well-saturated colors. No delineation problems. Artifacts are nowhere to be found. Sharp image all the way to the edges. I didn't notice any shimmering. The sound is as good as it could be. The only reason the sound doesn't rate a 10 is because FOX didn't restore the soundtrack for the deleted footage on Fincher's work print. In a couple of scenes it is very hard to hear. To FOX's credit, they are up front about the problems with the soundtrack and provide subtitles during those scenes. Otherwise the sound is rich and nicely balanced. Excellent use of the surround sound feature. Jerry Goldsmith's wonderful score never sounded better. Well, maybe when it was played live! According to Amazon.com there are two Easter Eggs. I found one. Please let me know where the other one is. I looked and looked. On Disk Four there is an Egg that leads to "A Boy and His Power Loader." This is an interview with Vin Ling, the film student who built a working model of a power loader on a dare and ended up working for James Cameron. It is the kind of story that gives hope to nerds everywhere hoping to break into the business. 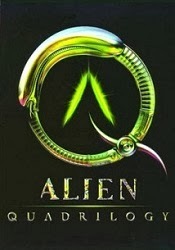 Amazon.com claims there is an Easter Egg on one of the two "Alien Resurrection" disks entitled "Alien Extra." Please let me know if you find it so I can update this review! There are so many extras that it would take unlimited bandwidth to cover them all. There are more documentaries and featurettes on this DVD than on any other boxed set I've ever seen. They threw in everything but the kitchen sink and a David Fincher commentary track. The 9th disk contains all of the supplemental materials for past editions and from the Laser Disk editions. It also includes all of the Theatrical trailers and TV spots for each film. FOX has given us everything old and powered it up with a whole lot of new! By far the best DVD set this year. Maybe of any year. If you are like EI's Stephen Wong and hate the 4th film, you will still want this DVD. A steal at twice the price. The work print of "Alien3" is a real find. You stick this in your honey's stocking and there will be no doubt that you love them.